Medmerry, in between Selsey and Bracklesham, is one of the stretches of coastline most at risk of flooding in southernEngland. Following extensive consultation on the 2008 Pagham to East Head Coastal Defence Strategy, the adopted solution is a managed realignment scheme where new defences are built inland from the coast and a new intertidal area is allowed to form seaward of these new defences. The new flood defences will offer 1000 times better flood protection than the existing defences, and are designed to provide flood protection against rising sea levels over the next 100 years. The seaward area will create new intertidal and freshwater habitats to compensate for some of the losses as a result of flood defence works around the Solent. Flood embankments. The main embankment will enclose the site and prevent flooding of the properties and infrastructure behind the scheme. The main embankment will have a length of approx. 6.8km, a crest height of 5.2m AOD, and a crest width of 4m. 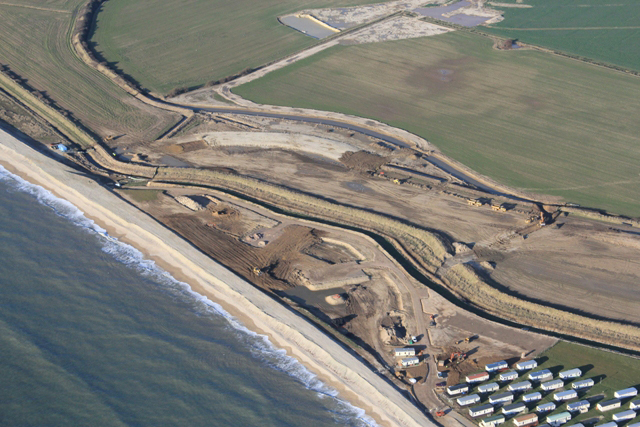 The embankments will be constructed by excavating material form borrow pits within the site which will form part of the intertidal habitat following completion of the scheme. Rock armour revetments. Two rock armour revetments will be constructed at the eastern and western extent of the scheme. These revetments will tie into the existing shingle ridge at their seaward extent. Embankment drainage. A trapezoidal drainage channel shall be constructed on the landward side of the embankment along its full length. The purposes of the drainage channel are to collect flow from existing drainage channels and carry such flows to one of the four outfall structures that will pass through the embankment and allow discharge to the intertidal area. Drainage Outfalls. There are a total of four drainage outfalls along the length of the new flood embankment. The outfalls comprise a pre-cast concrete culvert, trash screen, working platform, flap valves, access steps, security grill, stop logs, insitu concrete wingwalls and bed protection. Breaching the existing shingle bank. A 110m wide breach will be created within the existing shingle bank, centred on the existing sea outfall, which will be removed as part of the works. This will create over 300 hectares of intertidal habitat. Environment Agency maintenance access track. A 4m wide maintenance access track willl be constructed on the landward side of the main embankment. The track is designed to provide vehicle access for Environment Agency maintenance staff and also act as a footpath and cycleway for the public. An additional access track will be constructed to connect between the western car park, Earnley diversion channel and the flood embankment. A separate 5m wide grassed track will be constructed in all areas that are to have bridleway status. Public car parking and viewing. Two public car parking areas will be constructed along with 4 viewpoints, one of which will provide disabled parking and access. Emergency Services access track. An access track for use by the emergency services to provide a link between Selsey and Sidlesham will be created. 11KV Power Cable diversion. The existing 11KV power cable owned by Scottish and Southern Energy will be diverted around the perimeter of the new embankment. Diversion channel and associated structures. A new 1.8 km diversion channel will be constructed to alleviate the potential for flooding in the Earnley catchment. As a result of flood defence works around theSolent, important and protected wetland wildlife habitats are being lost and need to be replaced. There is nowhere suitable within theSolentto create this replacement habitat, soMedmerryis being designed to compensate for some of those losses. During the planning phase of the scheme in 2010, an Environmental Impact Assessment (EIA) was carried out to assess the impact of the scheme on the existing environment, and to help design appropriate mitigation for these impacts. We are working to mitigate impact on protected species such water voles, great crested newts, reptiles and badgers. The drainage channel around the bund has been designed as new water vole and we are creating reed beds as additional habitat. We are working with local farmers to design cropping plans to push birds from construction zones and pull towards safe zones. In addition to protecting the existing species and habitats at the site, important historic, archaeological and geological features have been identified and working with Natural England and local interest groups and specialists, measures are being taken to protect and record all archaeological and geological finds at the site.